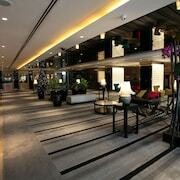 Which hotels are closest to the Singapore airport? 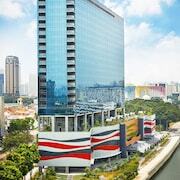 Can you find accommodation in popular areas of Singapore? 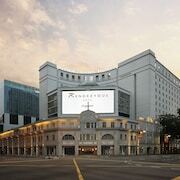 Where to stay near top Singapore attractions? What kind of hotels are in Singapore? 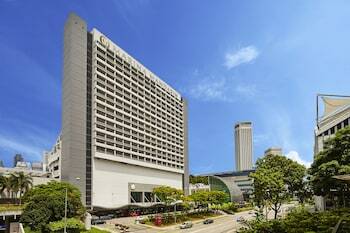 Which hotel chains are in Singapore? Travelers to Singapore will find plenty to explore and enjoy. 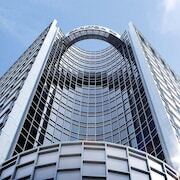 Top sights in the city include Chinatown Heritage Center, National Orchid Garden, and Universal Studios Singapore®. Cultural venues in the city include Chinatown Heritage Center, Asian Civilisations Museum, and Esplanade Theatres. Attractions like Universal Studios Singapore®, Singapore Flyer, and Singapore Zoo are fun for kids of all ages. Notable city landmarks like Raffles Place and Thian Hock Keng Temple might be worth a visit. Pan Pacific Serviced Suites Orchard, Singapore - This 5-star apartment in Orchard features free breakfast, a restaurant, and an outdoor pool. It's a favorite with Expedia travelers for its breakfast and pool. The Forest by Wangz - Our customers like the breakfast and clean, comfortable rooms at this apartment. Guests who stay at this 4-star apartment in Novena can enjoy access to an outdoor pool and free parking, along with an in-room kitchenette. 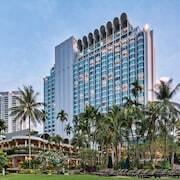 Sofitel Singapore City Centre - Guests who stay at this 5-star hotel in Chinatown can enjoy access to a restaurant and an outdoor pool, along with free WiFi. Other favorite sights in Singapore include National Orchid Garden, Singapore Turf Club, and Raffles City. 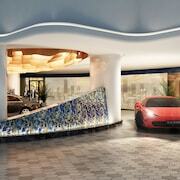 Walk to nearby metro stations like City Hall Station, Esplanade Station, and Clarke Quay Station. If you'd like to venture out around the area, you may want a car rental for your journey. With a smorgasbord of travel including water parks, historical sites, modern architecture, and fine gastronomy, Singapore delivers a unique and engaging holiday in the east. Spend your morning amid some of the most sacred buildings here, including the Sri Mariamman Temple and Sultan Mosque, and then pick up some quintessential local street food for lunch. An afternoon trip to a local water park is in order, where you can play in thousands of square metres of waterslides and splash pads. In the evening, Singapore invites you to Clarke Quay, where hip jazz clubs, fine dining, and entertainment abound. No matter what time of year you arrive on the island, you’ll find an overwhelming number of ways to spend your time. Singapore is home to a rich mix of vibrant neighbourhoods, historic sites, and world-class attractions that are sure to please any tastes. 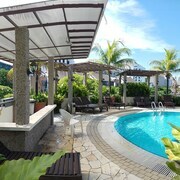 If lounging around is your idea of a good time, Sentosa Island provides an idyllic escape offering serious relaxation. Alternatively, nature and wildlife enthusiasts can discover local flora and fauna at the Singapore Botanic Gardens and Singapore Zoo. And for a bit more of an adventure, embark on a night-time safari to see local creatures in their natural habitats. If captivating views of Singapore are what you’re after, the Tiger Sky Tower and Singapore Flyer Ferris wheel each offer unobstructed bird’s-eye views of the gorgeous cityscape. As for history buffs eager to learn more about this country’s rise to prominence, they can discover the story of Singapore by visiting the Peranakan Museum and the National Museum of Singapore. Meanwhile, another great place to get an inside look at Singapore’s past is the Sri Mariamman Temple, the oldest Hindu structure in the entire country. 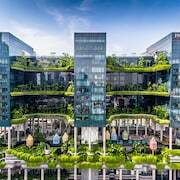 Thanks to its location just one degree north of the equator, Singapore is home to a tropical rainforest climate that experiences only one discernible season each year. Temperatures here are consistently high, generally staying between 24 and 31 degrees Celsius all year long. High levels of humidity are also the norm throughout the year, as is a steady amount of rainfall, which occasionally lasts for 24 hours at a time. Though the western side of Singapore does receive less rainfall than the eastern end, temperatures tend to be a bit toastier in the east, especially during April and May. Monsoons are also relatively common here, yet they don’t usually make landfall in April or October. Singapore hotels are generally characterized by modern design, sleek décor, and stunning views of the cityscape that surrounds guest rooms. 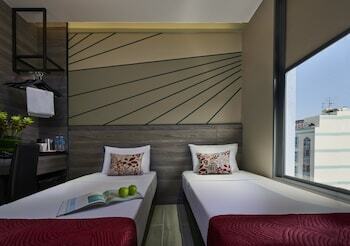 Still, Singapore accommodation manages to span across all budgets and travel styles. 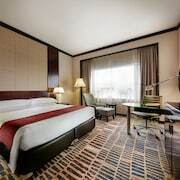 Whether you want to enjoy a busy holiday in the centre of the city with friends, or a more peaceful family holiday at a hotel with lush gardens, Singapore has a hotel for you. 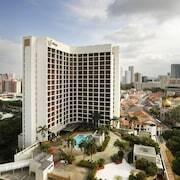 Book your next hotel in Singapore right here on Expedia.com.au, where our travel experts always track down the best hotel deals and Singapore holiday packages for you in every price range. You can arrive in Singapore by air via the Changi Airport (SIN). Once you land, take a ground shuttle to your hotel or rent a car right here on Expedia.com.au today. For your day-to-day travel, public buses have routes throughout the city. With an ever-growing city centre and thriving waterfront district, Singapore offers a holiday replete with both culture and metropolitan spirit. 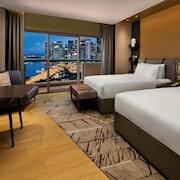 Make your next holiday to Singapore a comfortable with a stay at just the right accommodation. 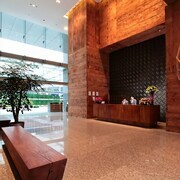 Search through hotels in Singapore and Singapore serviced apartments right here on Expedia.com.au today. Your adventure in Singapore starts right here with Expedia! 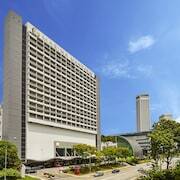 What are the most popular hotels in Singapore? 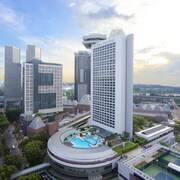 Are there hotels in cities near Singapore? Explore Singapore with Expedia’s Travel Guides to find the best last minute hotels, Singapore holidays flights, cars and more!